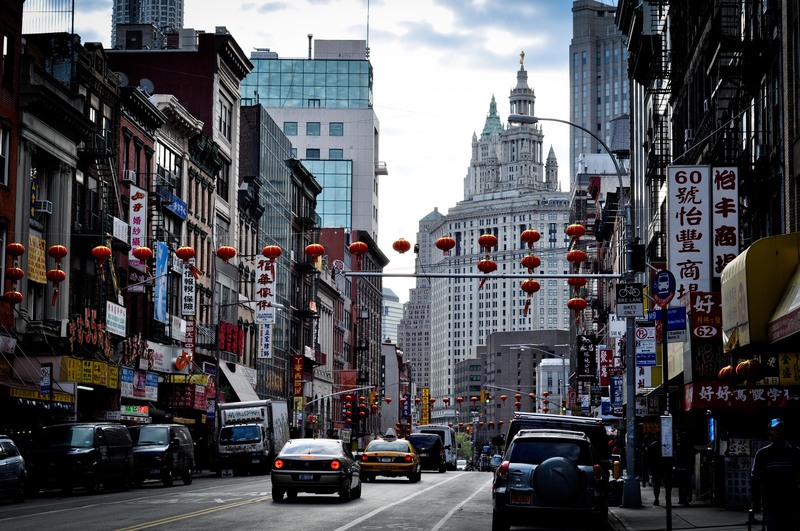 NEW YORK – Admittedly my experience with New York City’s Chinatown has not been lengthy (I have not been going there ‘since we were kids’) but I have done my fair share of exploring the area and have come to know it quite well. And while I’ve learned a lot – mostly that this overly crowded section of New York City, with its unruly odors and filthy streets, can test the nerves of even the most experienced urban traveler – I’ve also found it to be a place where you can still eat well and quite cheaply, which is a rarity in Manhattan. 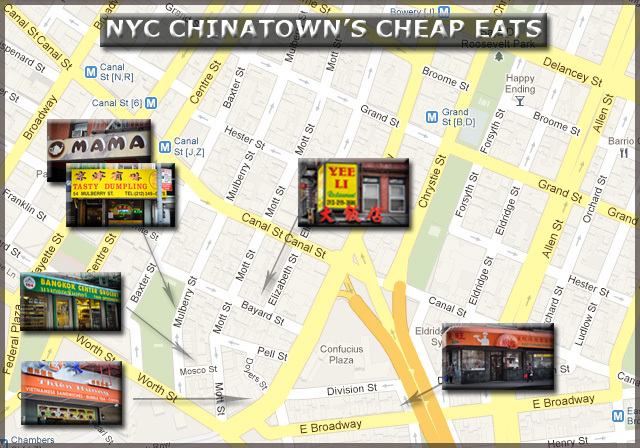 In fact, this has become a bit of an obsession for me – discovering the best tasting food deals to be had in Chinatown. So, I thought I’d share a bit of this obsession with you; here are five of my current favorite places in New York City’s Chinatown where you can eat well, cheaply. Cheap Bite: BBQ Pork Over Rice – the pork is lean, crispy and tender; while the rice is always fresh and never mushy . It also comes with a side of stir-fried cabbage, and a lovely fragrant dipping sauce of oil, ginger and scallions that’s traditionally served with roast chicken dishes, but goes surprisingly well with pork as well. Price: $4.50. Where: 1 Elizabeth St (at Bayard St). Cheap Bite: Chives and Pork Fried Dumplings doused with sweet soy and a light siracha sauce from Tasty Dumpling; followed by a Taiwanese style bubble milk tea (iced tea, sweetened milk and chewy tapioca bits) from Mama’s Eatery. Price: $1.25 for the dumplings (5 per order); and $3.95 for the bubble tea (ok, maybe the tea is a bit of splurge, but since you saved on the dumplings, why not treat yourself?). Where is it: Tasty Dumpling is located at 45 Mulberry Street, across from Columbus Park; Mama’s is a few doors down. Cheap Bite: Won Ton Mien Soup – fat won tons and thin egg noodles in a clear broth topped with a sprinkle of fresh scallions. At this typical Hong Kong style noodle joint, the ingredients are always fresh, noodles al-dente and the soup flavorful. One of my Chinatown faves. Service can be spotty but the food compensates. Be sure to leave a tip, or else they’ll chase you down as you leave.…seriously. Price: $3.95. Where: 70 E Broadway (between Catherine St & Market St). Cheap Bite: Pandan & Coconut Jelly – this refreshingly light (and not too sweet) Thai dessert also known as ‘Wun Gati’ is basically a layered jell-o of fresh coconut milk and sweetened pandan. The flavors, and the white and green jell-o layers always bring back fond memories of living in Thailand. You can find it in the refrigerated section of BCG, one of the few Thai specialty shops in Manhattan. Price: $3.95. Where: 104 Mosco St near Columbus Park. The little thing that makes Chinatown worthwhile: the smug satisfaction of eating well on the cheap and the atmospheric quality of getting my food to go so I can eat it while watching locals partake in a game of handball or (English) football at Roosevelt Park (along Chrystie St. and Grand Ave.). Cheap eats plus cheap entertainment! hello! i am at work at the moment so i did not have time to check out all of your post, however i do enjoy the stuff i read and i will read a little more at the site when i get back home.. Got a lot of things to complete at the job :p do you happen to have a profile on twitter? =) All the best!